Hey Mailchimp Users: Your API Integration Just Got an Upgrade! 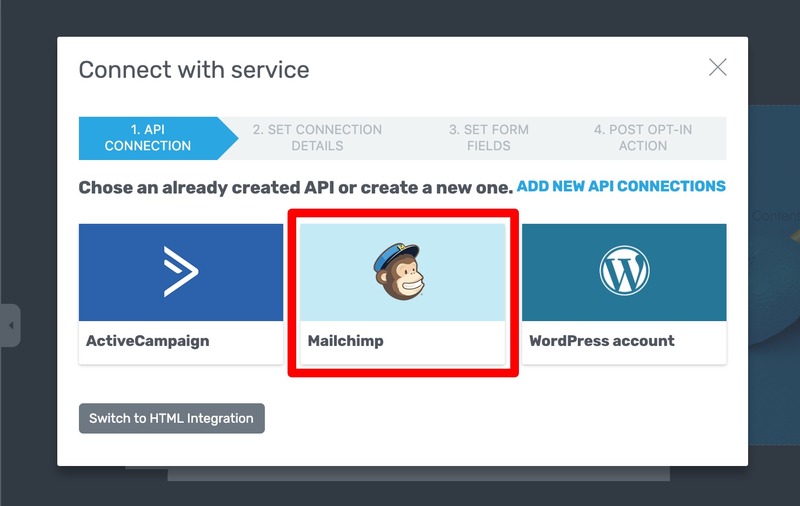 Hey Mailchimp Users: Your API Integration Just Got an Upgrade! Ready to take your list building to the next level? Use a different Email Service Provider? Learn how to use all of our other API service integrations by clicking here. 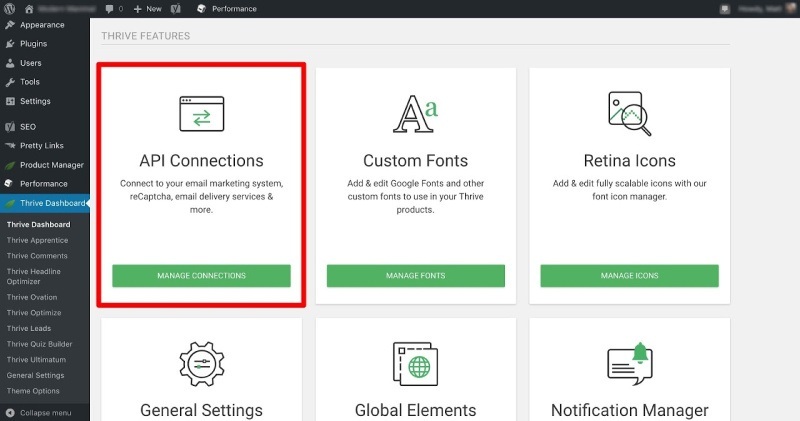 The basics of connecting your Mailchimp account with the Thrive Themes tools hasn't changed. But if you're not familiar with the process, here's how to get it done fast. Within your Thrive Dashboard, find the API Connections box and click the "Manage Connections" button. 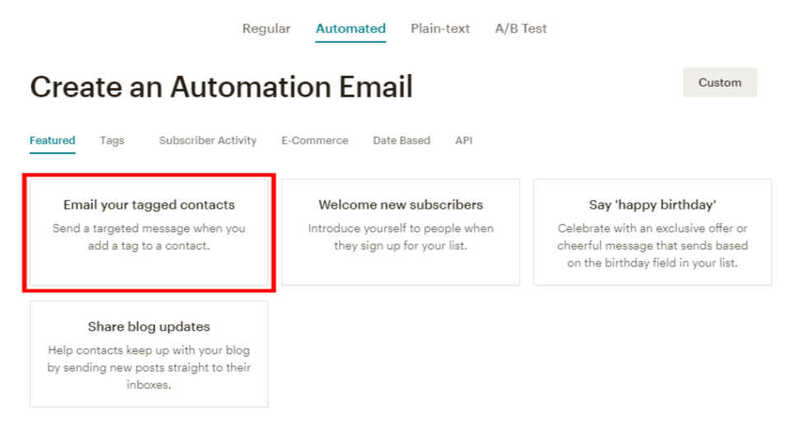 Next, start setting up your Mailchimp connection by clicking the "Add new Connection" icon and select "Mailchimp" from the dropdown menu that appears. The Mailchimp connection box where you'll enter your Mailchimp API key to complete the integration setup. 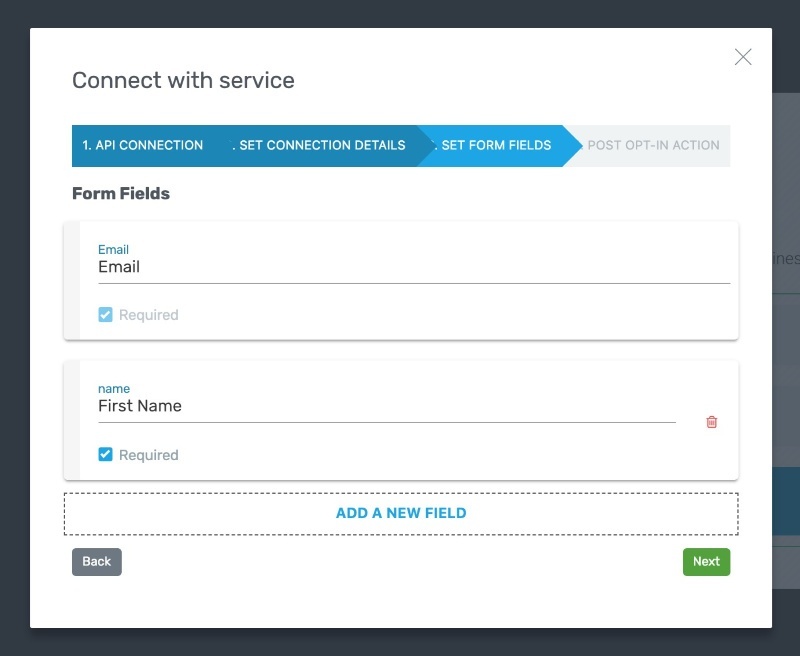 Once you enter your API key into the connection box and click "Connect", your lead generation forms inside Thrive Architect, Thrive Leads and Thrive Quiz Builder will then be able to send new subscriber information over to your Mailchimp account. 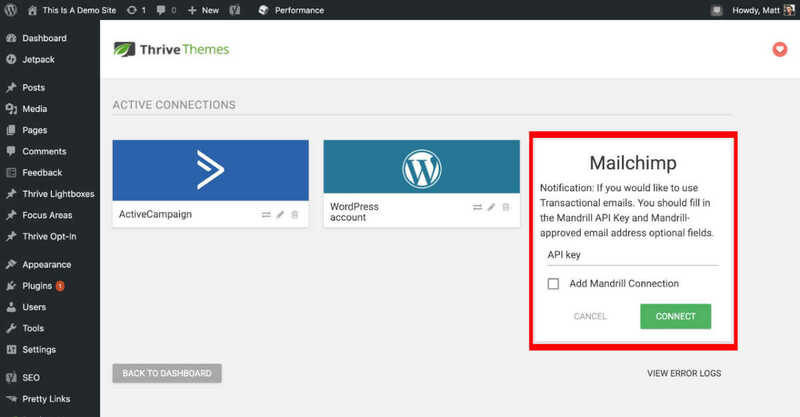 To find your Mailchimp account API key, first login to your Mailchimp dashboard. Then navigate to your "Profile" page from your account drop down menu in the navigation bar. From there, click on "Extras" within your "Profile" page sub-menu and select "API keys" from that drop down menu. After this last page loads, scroll down to find your current list of Mailchimp API keys or create a new key by pressing the "Create A Key" button. Note that the lead generation form connection process is the same whether you're using Thrive Architect, Thrive Leads or Thrive Quiz Builder. The screenshots below showcase the workflow setting up a form in Thrive Leads. 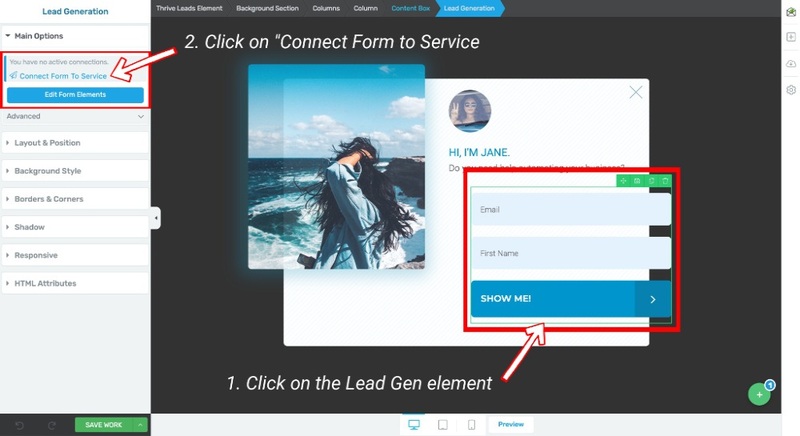 Start connecting your lead generation form to Mailchimp by 1) Clicking on the lead generation element in the Thrive editor, 2) Then clicking on the "Connect Form To Service" text that appears in the left sidebar. 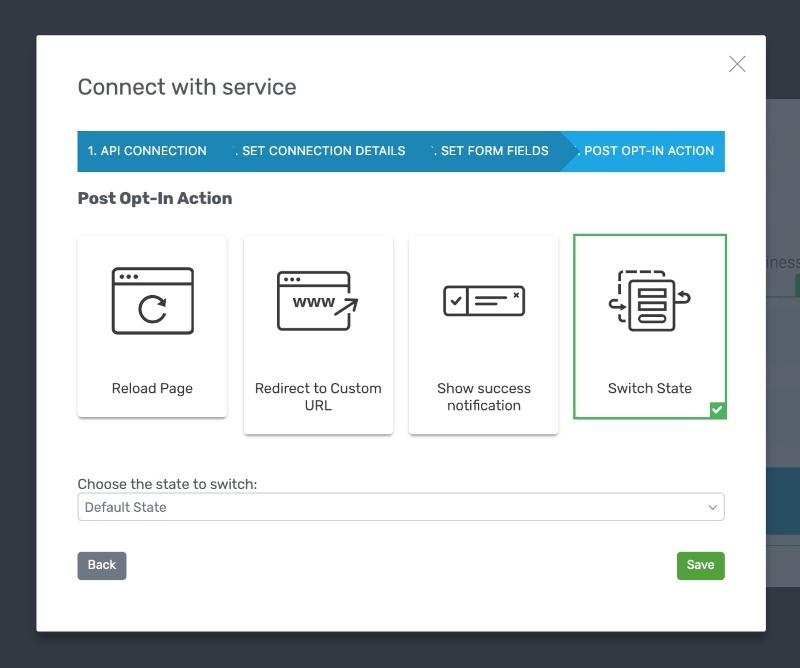 Select the Mailchimp option that appears in the first "Connect with service" popup lightbox step. Choose your Mailchimp mailing list from the first dropdown menu. Choose a Group Category to assign new subscribers to in the second dropdown menu (optional). If the Group Category you selected has Group Names associated with it (e.g. Beginner, Intermediate, Advanced), you can select one of them when they appear after setting the Group Category step. Choose either Single optin or Double optin from the next dropdown menu. Selecting Double optin means that new subscribers must confirm their subscription after signup. Finally, type in any tags you want new subscribers of this form to be assigned. If you want to add more than one tag, use commas to separate them. 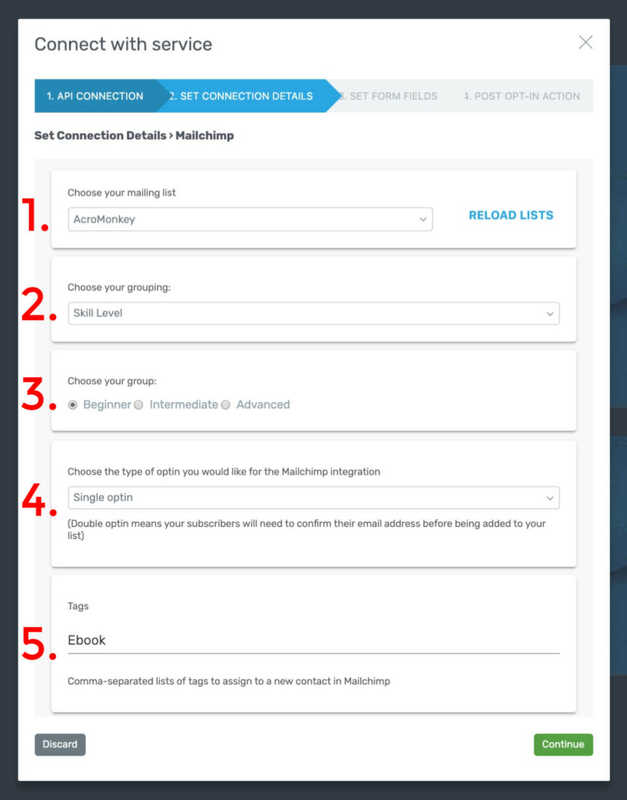 Setup the details you want to your lead generation form to collect for your Mailchimp account. Once your connection details are set, click the "Continue" button. Setup your form fields (Email is required, but the Name and Phone Number fields are optional). Click the "Next" button once your form fields are set. Remember that you can customize the prompt text each form field will display as well. Finally, select your Post Opt-In Action by clicking one of the options in the last "Connect with Service" popup lightbox screen. Show a success notification like: "Success! Thanks for signing up!" The last step: select your Post Opt-In Action. Thrive Leads Lightbox forms offer the 4 options shown above where Thrive Architect only offers the first 3 options. For Thrive Architect lead generation forms, only the first 3 options are available to you. Now click "Save" and your lead generation forms are ready to start collecting new subscribers and send the data over to your Mailchimp account! 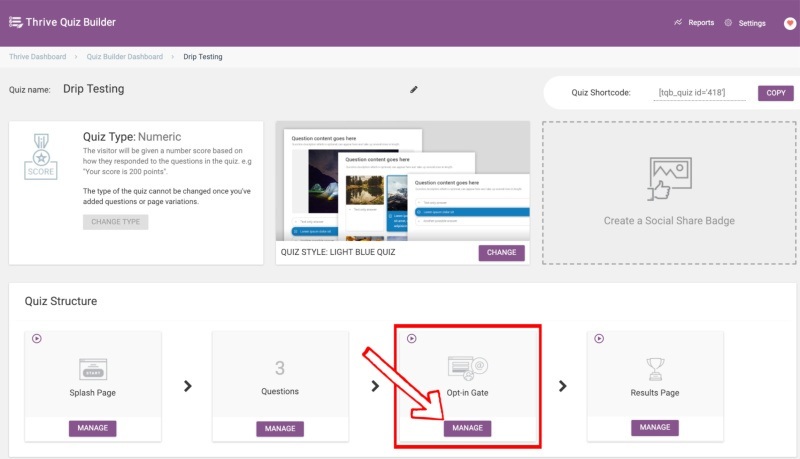 Like I mentioned above, you can also connect your Thrive Quiz Builder lead generation forms to your Mailchimp account. You'll usually place your lead generation forms on the "Opt-in Gate" step of your Thrive Quizzes. Now, when it actually comes to connecting your lead generation forms to Mailchimp from within Thrive Quiz Builder, the only difference is that you have just one Post Opt-In Action to choose from: "Go to next step in quiz". 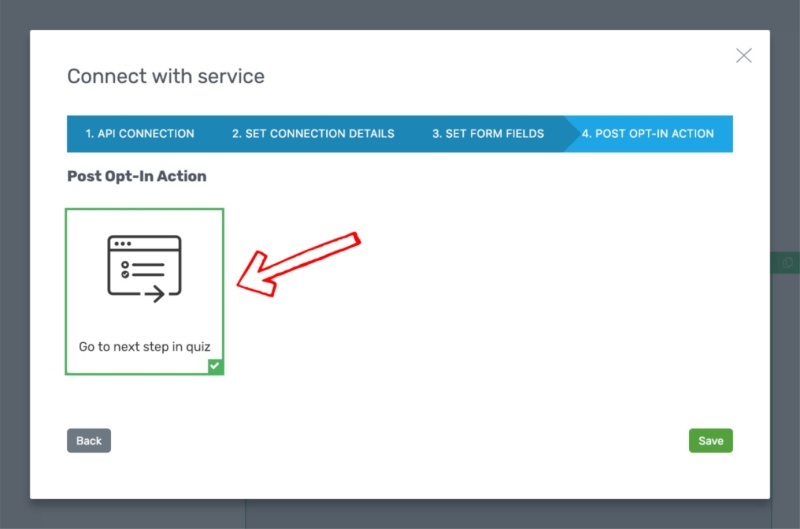 The only difference to connecting lead generation forms to your Mailchimp account in Thrive Quiz Builder is that you only have a single Post Opt-In Action to choose from. That's right, all of the other mailing list selection, grouping and tagging options are the same to what I showed you earlier. Just select the single Post Opt-in Action and click "Save" to finish. Answer Based Tagging in Thrive Quiz Builder is now up and running for the Mailchimp integration too! Click on the "Manage" button in the Questions area of your TQB quiz. 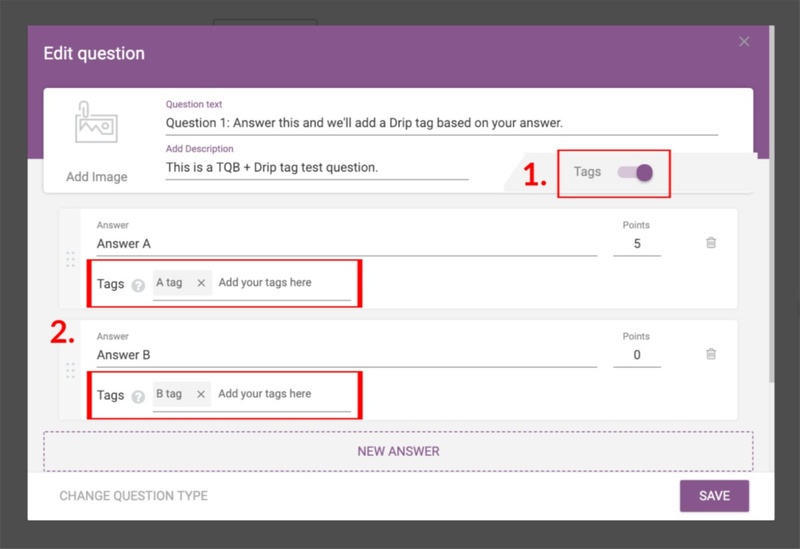 How to use answer based tagging in TQB: In the Edit Question lightbox that appears after creating a quiz question, 1) activate the the "Tags" slider and 2) apply your tags to your answers. A maximum of 5 tags can be added to each answer. Your Mailchimp subscribers can now receive TQB quiz Answer Based Tags! With this awesome new feature, you'll be able to achieve much deeper segmentation in your Mailchimp mailing lists! Now that you can apply opt-in form tags, TQB answer based tags and Group Categories and Group Names to your new subscribers, it's time to go bananas when it comes to creating your email marketing automations in Mailchimp. Now that you can add tags, group categories and group names to your new Mailchimp subscribers, you'll be able to use them as triggers in your Mailchimp email marketing automations. Not only will new subscribers be added to the exact Mailing List that you want, but the specific tags and group identifiers your quiz answers and lead generation forms collect can then be used as triggers within your Mailchimp email marketing automations. Are you a Mailchimp + Thrive Themes combo user? Give our new and improved Mailchimp integration a try and let us know what you think in the comments below! Excellent! This is just the feature I have been looking for, for some of my clients. The only bit where I get a bit confused is on the ‘grouping’ and ‘groups’ parts of the set up. Are these created on Mailchimp first? Can you explain the logic of how to use them? Do the tags auto-generate on Mailchimp when you enter them in Thrive, or do you need to create them in Mailchimp first so they can link up…? Sorry about all the questions. Mailchimp isn’t that intuitive for me…. So, both the grouping and the groups can be created by you, in MailChimp. – And then, finally, you have the tags, that will be assigned to each of your users either through a Lead Generation form or through a quiz (so that you can create an even better segmentation). 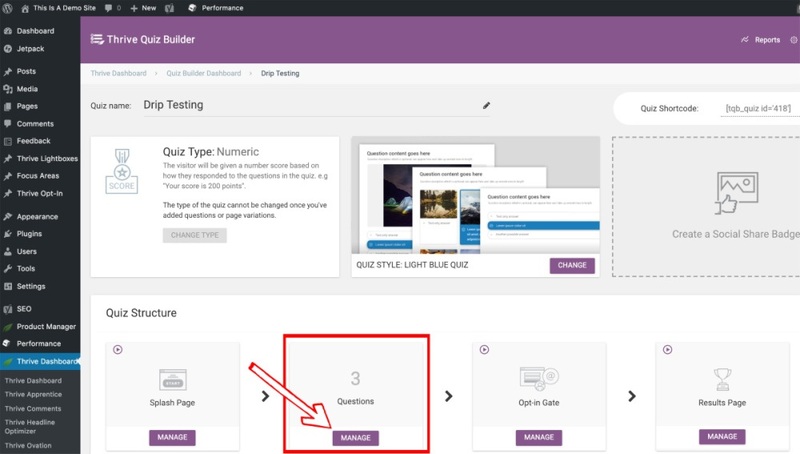 You could have seen in the video, in Thrive Quiz Builder for example, you can assign tags to the answers, and then you can see what answers the visitor gave, because all the tags will appear next to his name, in MailChimp. Many thanks, David, for your thorough explanation. It’s good to get a handle on the hierarchy of things, what you do in Mailchimp and how it interacts with Thrive. You would more want to use groups to manage interest since that is the missing key ingredient here for us to be able to tag contacts. You could create a group for example called interest. Within that group, you can create sub groups such as hiking, sailing, camping and subscribers can choose what group they would like to receive content about. So in other words, I must ask people for their interests and then manually tag over 2,000 people? Correct. If you wanted to tag contacts. Since we would need a way to determine someones interests. You wouldn’t have to manually tag the 2,000 + individuals though. You can segment your list by the interest and bulk tag contacts. Indeed. So it appears you are capturing interest with groups already. So if you wanted to tag contacts you can simply segment your list by groups. once you have the contacts segmented you can tag them in bulk. Many thanks, Sarah. This will save a lot of time! Thank you Thrive for releasing this feature. I’m a Mailchimp user and I’m glad you are working hard to get Mailchimp integrated with Thrive. BUT, there’s still something that you should work in order to get really a fully integration with Mailchimp. BE ABLE to add ALL fields from a list and not only name, email and phone. This is something very, very, very, very…. and very important for who are working on list segmentation like me. So far, I spend so much time to “adapt” my lead forms to accept all fields from my list AND “customize” the labels I set on my Mailchimp forms. I’m looking forward to having this feature on Mailchimp API. Thanks for this Matt! I found that it worked seamlessly for my course opt-in through Thrive Architect. I was going to use Drip but stayed with MC due to this feature. Just in time, eh Sarah? Glad the new feature worked out for you! What an amazing feature on updated. I’m not a MailChimp customer. But, after this updating, I will try to use it. I was wondering, if there is a way, to also transfer the Quiz’ result to the new contact? 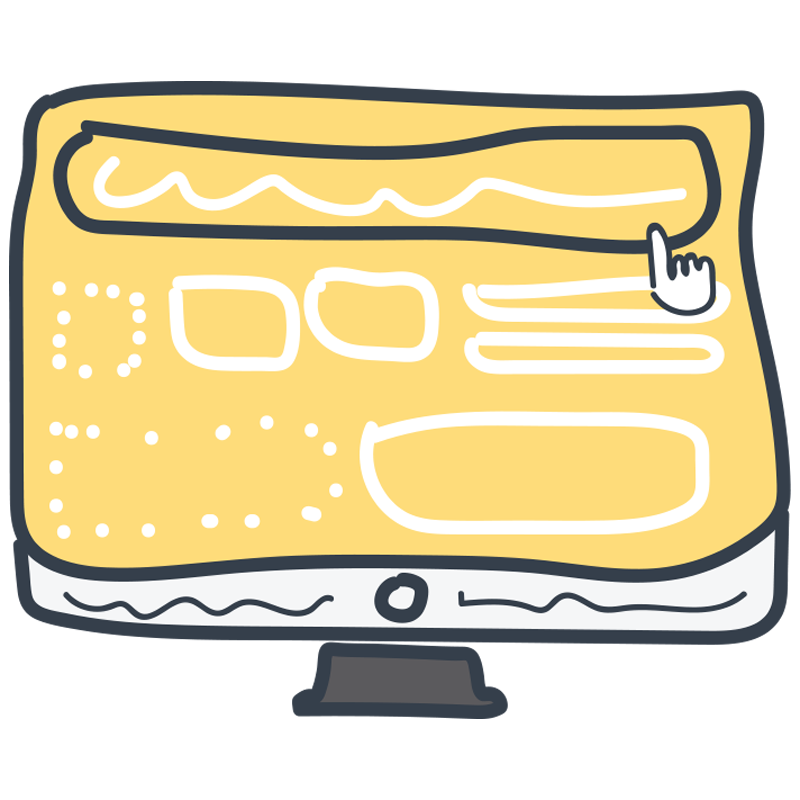 It would be very important for a decision, which different campaigns should run for the user. Furthermore it seems, there is no real integration of Double-Opt-In for Quiz Builder, as the person who Opted-In (1st Step) for the Quiz-results immediately gets the results, and not after the approval of the verification mail. Is this on a current roadmap?